One thing I like to do is Numerical Analysis. But I like to crunch numbers. graph them, and look for patterns. I know it may seem like a strange hobby. SO-- I've first gotta admit, what started me on this journey of number crunching is to see if there is a winning strategy for Howie Hawkins in November. Then I discovered something strange in the data concerning the recent Democratic Primary. What looks like LOW TURNOUT. either Carl Paladino or Rick Lazio. Was that some hot race? 3,130,122 registered Republicans, and 5,507,920 Democrats. So that's about a 15% turnout. voted in the primary, out of 154,202 total. That's 12%. Are you tracking me so far? and a whirlwind statewide tour-- 549,877 people voted. That's only 9%, OF THE 5,910,140 registered Dems in 2014. So that is LOW TURNOUT according to Republican standards. for Teachout v. Cuomo? I WOULD. 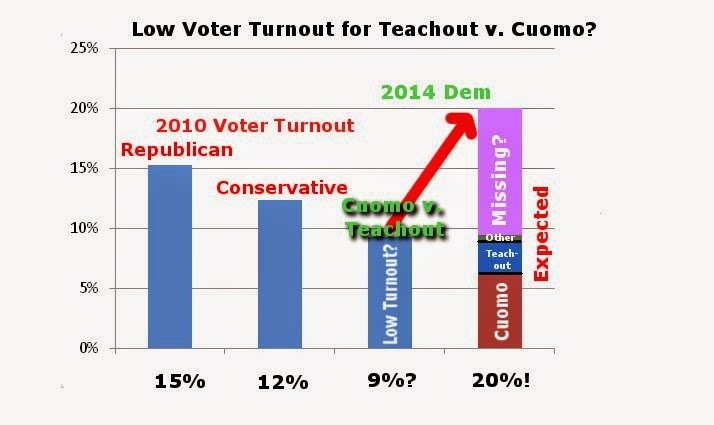 Could there be 20% (expected) - 9% (reported) = 11% missing votes for Teachout?